Born in Bristol in 1915, Mary Fedden is renowned for her unique perspective and great talent for finding beauty in the everyday. Today, on what would have been the much-loved British artist’s 102nd birthday, our resident Modern British expert Georgia Hughes takes a look back at Fedden’s life and work. Fedden’s love of art materialised at an early age and she embarked on her career as an artist in 1932 when she began studying at the Slade School of Fine Arts at the age of 17. During her time at Slade she was taught by renowned designer Victor Polunin, which led to a brief spell as a set designer for Sadler’s Wells before she moved back to her beloved Bristol to work as a portrait artist and teacher. With the outbreak of WWII in 1939, Fedden contributed to the Land Army and the Naafi, as a field worker and a driver but also in an artistic capacity, painting several murals commissioned by the Women’s Service. However it wasn’t until after WWII ended that Fedden’s distinctive style and love for still life began to develop. While her earlier works had a more traditional, post-romanticism bent, she became fascinated by impressionist, post-impressionist, and contemporary abstract artists from Matisse to Nicholson and her work began to take on its now famously unusual use of perspective and colour. It was also around this time that she reunited with her soon-to-be-husband Julian Trevelyan, acclaimed artist, poet, and printmaker. While the pair had met during their time at Slade, it wasn’t until Trevelyan’s existing marriage broke down in 1949 that he and Mary ultimately fell in love. They married in 1951 and moved into Trevelyan’s Durham Wharf Studio on the Thames. Trevelyan would go on to become another of Fedden’s key influences, his talent for printmaking well-suited to her love of flat planes and odd perspectives. She began to work with ever bolder palettes and simplified shapes, carefully orchestrating her still life compositions to draw out the extraordinary from ordinary objects. In fact it’s her constant progression and development throughout her career that makes her overall body of work so interesting; from her earlier pieces playing with colour, perspective, and patterns to her later work experimenting with light, texture, and crisper, cleaner lines. If her overall style and technique was always developing, her subject matter retained a consistency that unifies her oeuvre. She was forever fascinated with the shape and form of the everyday objects that she returned to again and again such as fruit, feathers, and plants. While she spent her life insisting her chosen subjects held no symbolic meaning and that she simply painted things she liked to paint, her work remains much more complex than simple still life. She was actually intrigued by the natural focus of the eye and, rather than presenting one unified image, wanted to capture on canvas the way the eye is able to focus on one object in a scene in multiple ways. To achieve this she played with perspective, putting multiple objects seen from different perspectives and lit from different angles into the same image. She also simplified objects down to their most basic forms and colours, using her signature flat planes to heighten the effect, each usually set on a bold background that provided harmony to the painting and emphasised each object even more. In doing so she was able to bring focus to the beauty of each object, celebrating and elevating her subjects far beyond mere still life. At one time, Mary Fedden was seen as secondary to her husband as an artist, a mere protegee following his teachings. However in later years, and especially since her death in 2012, collectors have grown more appreciative of the painter as an individual. Nowadays there is a firmly established Fedden market, with some of her work recently selling for upwards of £100,000, a sign that the art world is finally recognising an idiosyncratic style that was wholly Fedden’s own. Fedden originally studied at Bristol’s prestigious Badminton School – but hated every minute of it. Fedden was the first ever female tutor at the Royal College. During her time at the Painting School, she famously tutored David Hockney. While Hockney never specifically cited her as an influence, Fedden is thought to have inspired his use of flat perspectives and bold colours. Fedden never painted with the colour Prussian Blue after her husband found a tube of it in her painting supplies and threw it away. After her husband died whilst working a commissioned painting of Strawberry Hill House, Fedden wanted to keep the original so painted her own surreal, fantastic version instead. Hers is now worth more than her husband’s would have been. Fedden was elected a royal academician in 1992 and awarded an OBE in 1997. 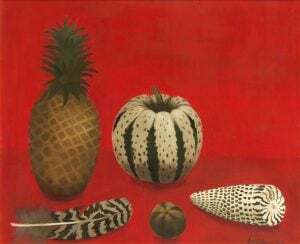 Here at Trinity House we are pleased to be responsible for the sale of several original Mary Fedden pieces, spanning much of the length of her career. 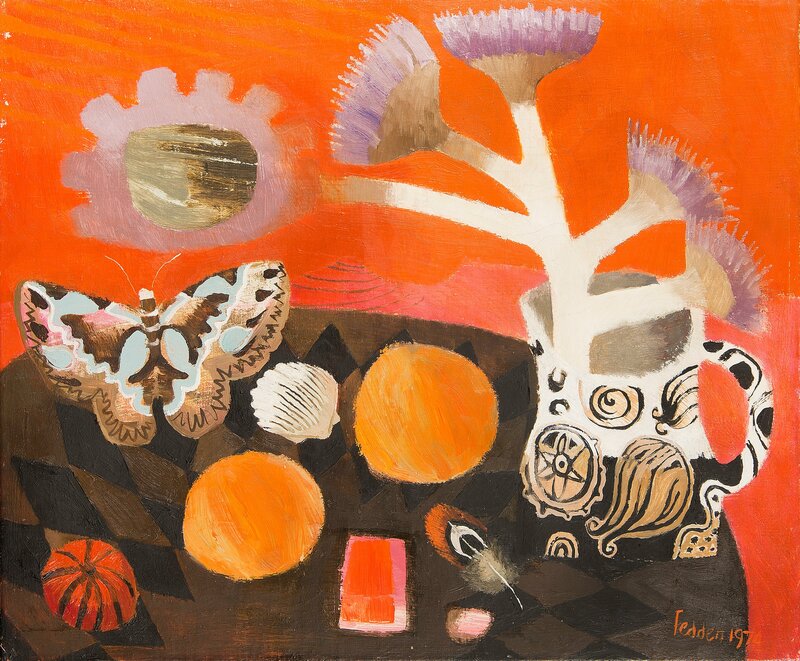 From earlier pieces such as Moths on Orange (1974) that typify her style to later works such as Pineapple and Still Life with Pear, Melon, and Grape (from 2007 and 2006 respectively) that show her increased experimentation with light and abstract techniques. Our collection has fantastic range and something to suit fans of all stages of her career. For more information and to view the rest of the pieces, visit our Mary Fedden Collection page.